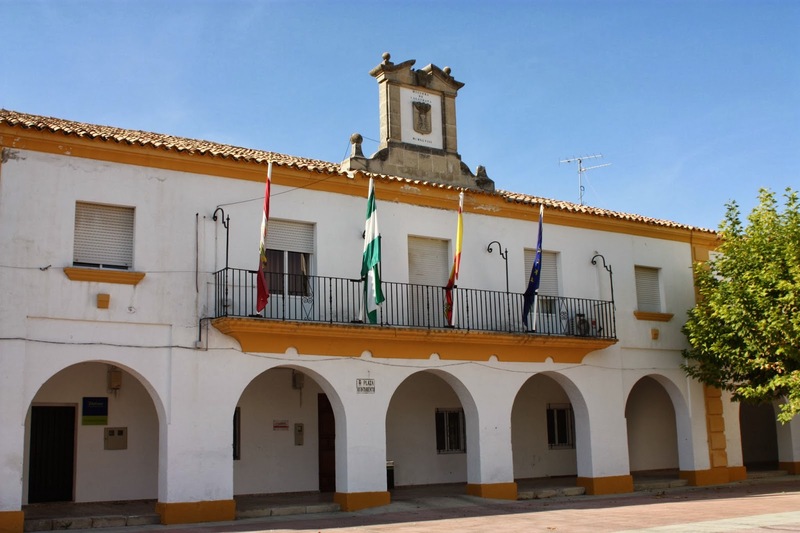 The municipality of Higuera de Calatrava (642 inhabitants in 2014; 3,930 ha; municipal website) is located in the extreme west of the Province of Jaén, on the border with the Province of Córdoba, 40 km of Jaén. Higuera emerged as a small Muslim hamlet, of which nothing is known before the Christian reconquest. Known as Martos, the hamlet was incorporated to a Commandry of the Order of Calatrava. The Order erected there a castle, of which the donjon is still standing, locally said to have been the place of a bloody battle that opposed in 1431 John II of Castile to the King of Granada. Higuera de Martos was granted the status of villa in 1600, its name being changed to Higuera de Calatrava. The flag (photo) and arms of Higuera de Calatrava, adopted on 28 January 2000 and 24 April 2001, respectively, by the Municipal Council and approved on 7 March 2002 by the Royal Academy of Córdoba, are prescribed by Decree No. 170, adopted on 4 June 2002 by the Government of Andalusia and published on 4 July 2002 in the official gazette of Andalusia, No. 78, p. 12,056-12,057 (text). This was confirmed by a Resolution adopted on 30 November 2004 by the Government of Andalusia and published on 20 December 2004 in the official gazette of Andalusia, No. 246, pp. 28,986-29,002 (text). Flag: Panel divided into three equal vertical stripes. The central stripe itself divided into two stripes, one upper and the other lower. The upper stripe shall be white and shall bear in the center the coat of arms; the lower stripe shall be Andalusian green and shall bear in the center a Almohad tower with three crenels. The two remaining stripes shall be crimson red. Coat of arms: Of Spanish shape. The field shall be or with a cross flory of Calatrava gules in the center. In the lower part, two chains sable one per bend the other per bend sinister. The shield surmounted by a Royal Spanish crown closed. The upper, white part of the central stripe represents the Order of Calatrava, being charged with the coat of arms, while the lower, green part of the central stripe represents the Umeyyad past, being charged with the Almohad tower that exists in the village. The two crimson stripes represent the Kingdom of Castile, as a symbol of the banners granted by the Catholic Monarchs to the reconquered places. The coat of arms represents the Order of Calatrava, through its cross, recalling that the village was established by the Order in the Martos plain reconquerred by Ferdinand III the Saint.